My hubby says this is the cookie you want to buy when you walk into a bakery or coffee shop and I couldn’t agree more! It’s super chocolatey, sweet, gooey and everything a treat should be. I generally use raw, organic unbleached sugar in my baking but if you do too, don’t use it in these. You really need to use regular, white (vegan friendly) granulated sugar to get the perfect texture. Preheat the oven to 350 F (175 C). Mix your flaxseed and water in a small bowl and set it aside. In a large mixing bowl combine your white and whole wheat pastry flour, cocoa powder, baking soda, baking powder and salt. Set aside. 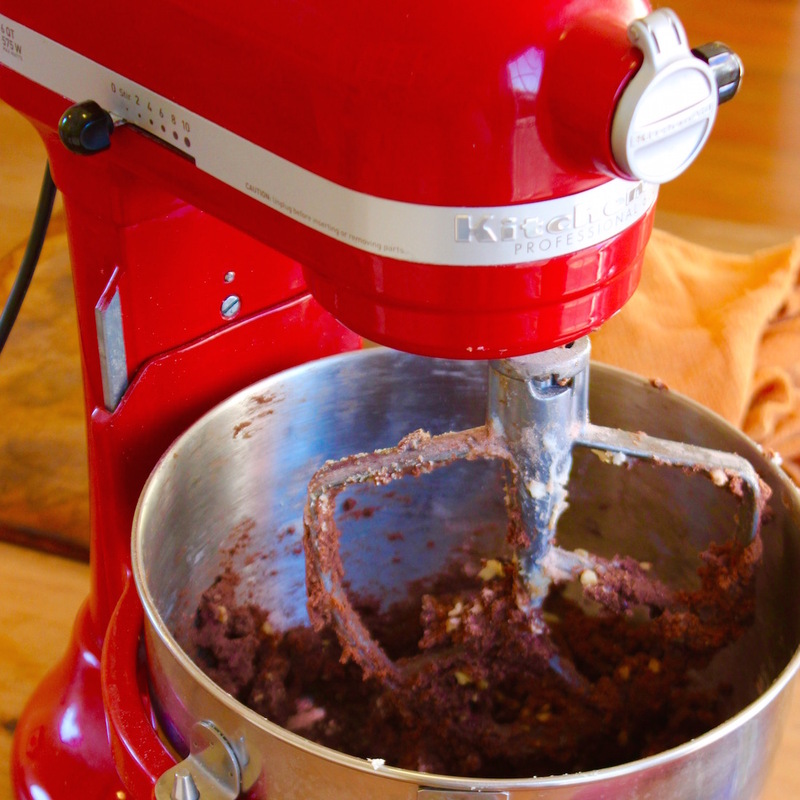 Using an electric mixer , mix your ‘butter’ and sugar until creamy. Add your ‘flax egg’ (the water and flaxseed you mixed together) and vanilla and mix until well combined. Slowly add your dry ingredients and mix just until combined (Do not overmix!) Add your chocolate chips and walnuts and gently fold them in. Form your dough into balls (this should make 12-13 large-ish sized cookies), place them on your cookie sheet (I swear by this stone baking sheet ) and flatten slightly. Add 4 or 5 chocolate chips to the top of each cookie before baking. Bake for 10-11 minutes. Adapted from Patrick- Goudreau, Colleen. “Chocolate Chocolate Cookies”. The Vegan Table . 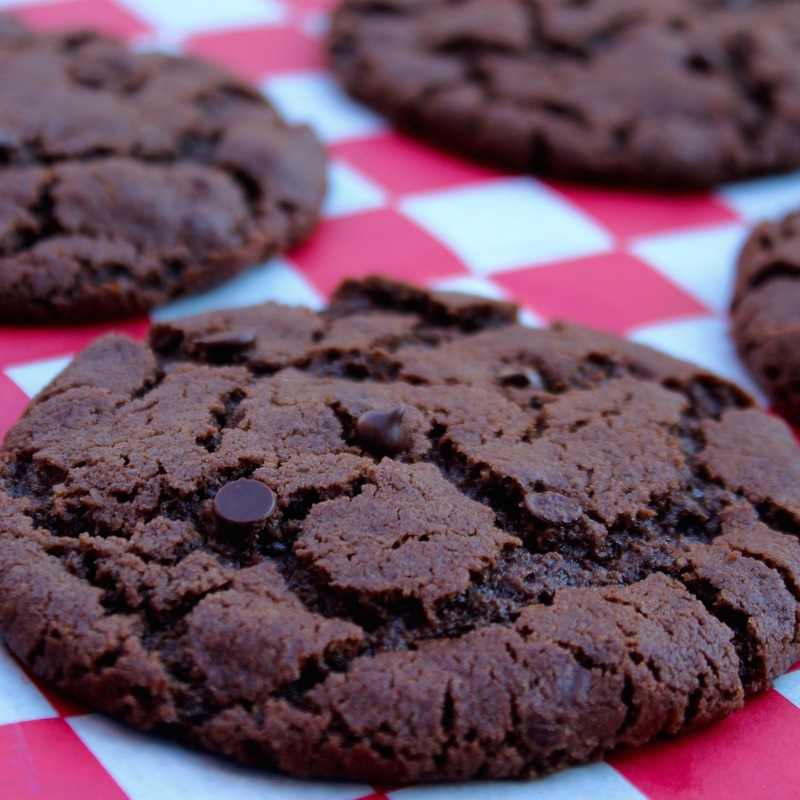 A super chocolatey sweet gooey double chocolate chip cookie. Adapted From: Patrick- Goudreau, "Chocolate, Chocolate Chip Cookies". The Vegan Table. Mix your flaxseed and water in a small bowl and set aside. In a large mixing bowl combine your white and whole wheat pastry flours, cocoa powder, baking soda, baking powder and salt. Set aside. Using an electric mixer, mix your 'butter' and sugar until creamy. Add your flax egg and vanilla and mix until well combined. Add your chocolate chips and walnuts and ensure everything is well blended. Form your dough into balls (this should make 12-13 cookies) and flatten slightly. Add 4 or 5 chocolate chips to the top of each cookie before baking.